Boiler Repair Advice You Need to Take | Weilhammer Plumbing Co. Inc. When it comes to your water heating, a guarantee can go a long way. This is why it is recommended to always call on a professional for boiler repair and service. Repairing, replacing, and maintaining a residential boiler is a complicated task that requires industry specific knowledge and experience. There are many topics, such as combustion, turndown ratios, and flame safeguard systems that are foreign to most homeowners. A professional plumber can assess damages and determine weaknesses with the help of their state-of-the-art equipment and industry technology. It is making strange sounds. This is usually a sign that there is lime scale buildup on the heat exchanger unit. The restricted water flow can cause strange gurgling or squealing noises. It is turning on and off. A boiler that continues to turn on and then shut off is wasting energy. This is a symptom of low water pressure, a closed valve, or a problem with the connecting thermostat. There is water pooled around the base. If you see water dripping or pooling around the boiler, there is likely a malfunctioning component internally. It is giving off an odd or foul odor. This should be treated as an emergency since the odors could be caused from a dangerous gas leak. Contact a licensed plumber immediately, even if it is after-hours. Find an emergency plumber who can help. Your radiators are cold. Sludge buildup in the boiler could cause your radiators to not heat up as much as they should. If only the top is cold, you need to bleed it. If the entire radiator is cold, it is likely the boiler. If you notice that your boiler is not functioning properly, or is acting suspiciously, it is important that you contact a professional plumbing repair company right away. One of the biggest mistakes homeowners make is ignoring an appliance problem until it gets worse. Once the issue becomes worse, the expense gets higher. The second largest mistake homeowners make is turning a repair job into a DIY task. Boiler installation and repair is complex and requires training and experience to understand completely. To avoid high and frequent repair costs, be sure to have your boiler serviced and inspected at least once per year. This will keep you updated on the performance value of your appliance, and forewarn you of any approaching repair needs. 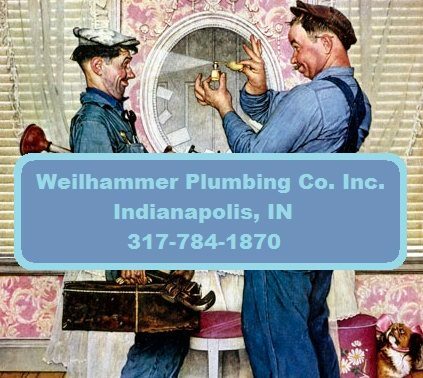 Call Weilhammer Plumbing at 317-784-1870 for prompt and professional Indianapolis boiler repair and water heater repair at an affordable price. Master plumber, Mark Weilhammer, is happy to answer your questions about plumbing repair, replacement, installation, maintenance, and more. We offer free advice and estimates as well. Call 317-784-1870 to request a free estimate today! This entry was posted in Plumbing Repair and tagged Indianapolis Boiler Repair. Bookmark the permalink.